I have been in New York this week. A client called me up on Monday for a round of meetings and hasn’t let me go since. Not that much is actually happening to require my presence (the negotiations have been stalled since Monday afternoon); mostly I think the client just wants to know it has me ready at hand, just in case. The upshot for me has been a week of inconvenient workdays followed by evenings of phenomenal theatre. The Belasco Theatre just off of Times Square is running Shakespeare’s Twelfth Night and Richard III in repertory (meaning that the same group of actors performs each play in alternation). The productions are imported from the Globe Theatre in England and have gotten glowing reviews from everyone (for a sampling, check out the New York Times, The New Yorker, and the Washington Post). 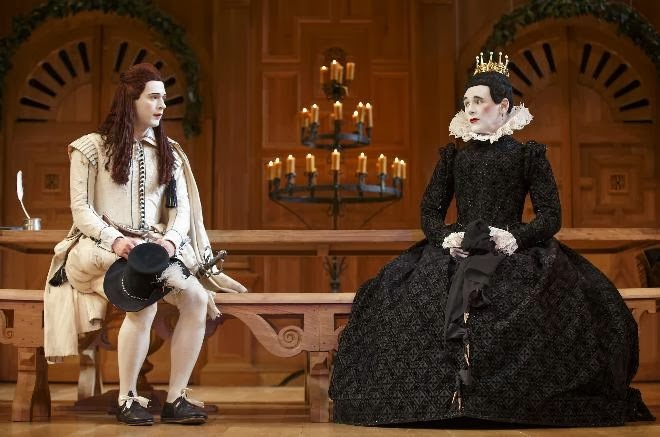 On Tuesday I managed to duck out of work in time to see Twelfth Night; last night I saw Richard III — and I’m still recovering from both. Watching these plays was the sort of rare, truly magical experience that makes you want to laugh out loud for sheer happiness while watching them, and leaves you for days afterwards feeling like a different person, like the world is somehow a better, more wondrous place than it seemed before. The cast is all male, as it would have been in Shakespeare’s day, and everything about the set, costumes, music, etc. is as authentic as possible. 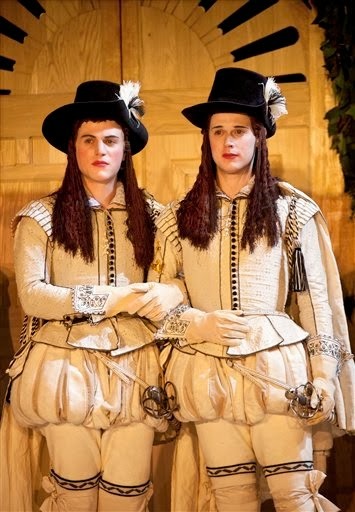 For example, the clothing is all hand-made by artisans using the same materials as existed in Elizabethan times (wool, linen, leather; buttons, clasps and hooks, no zippers; silk wigs). 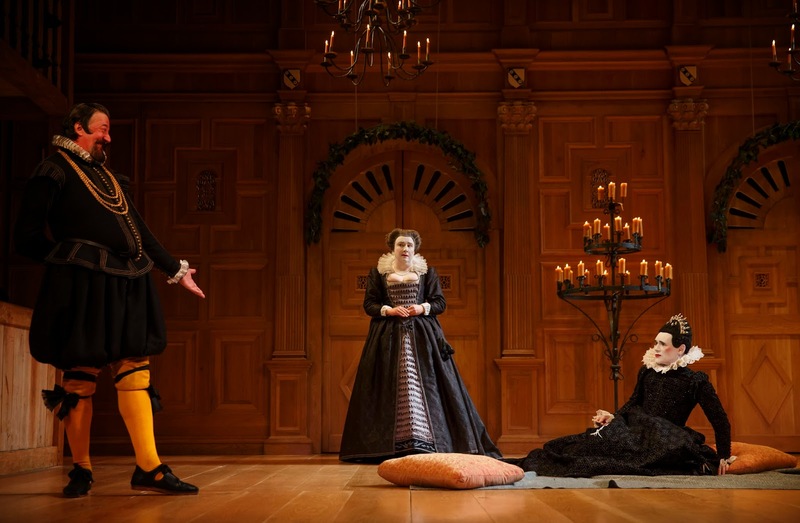 The stage is set to look like the sort of grand hall where plays like this were performed in great houses and colleges while touring away from the main playhouse; the chandeliers are lit by real beeswax candles that drip throughout the performance. The music is live; performed by musicians using period instruments. And the performers dress and apply their makeup onstage in front of the audience (also as apparently was done back in the day). The integrity of these trappings bring a magic all their own, but the life of the shows is in the performers. I was familiar with several of the actors from before. 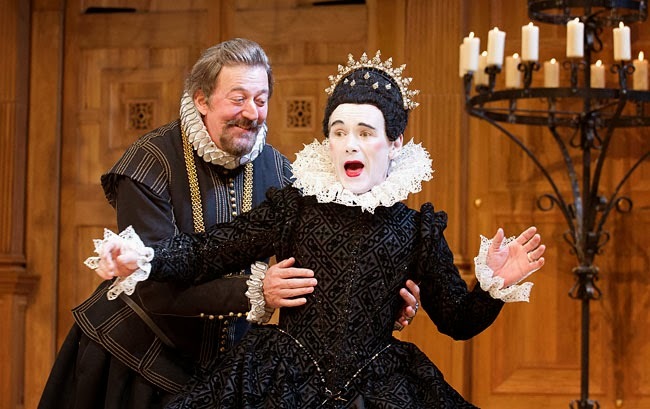 I’d seen Mark Rylance in the hilarious Boeing Boeing, and Samuel Barnett in History Boys, both on Broadway several years ago; and Stephen Fry I know and love from the British TV show QI (though he’s done a lot else, too). The performances were strong across the cast, with thoughtful and subtle portrayals of each of the characters. And there was no shouting. One of my biggest complaints, even about generally good Shakespeare productions such as those put on by the Shakespeare Theatre Company in DC, is that too often the level of intensity for every emotion is ratcheted so high that I come away feeling beaten and a little dead. 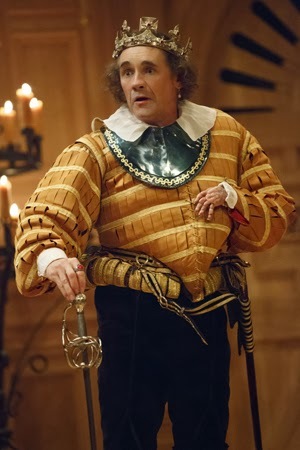 In fact, just the other day I was thinking how nice it would be to see a production where people just spoke plainly in an ordinary tone of voice, leaving the shouting and anguish to scenes (if any) that truly deserve it; where the actors speak like human beings, not like SHAKESPEAREAN ACTORS. What a pleasure, then, to find that very thing in these two plays! There was no overwrought anguish; no shouting where shouting wasn’t required. 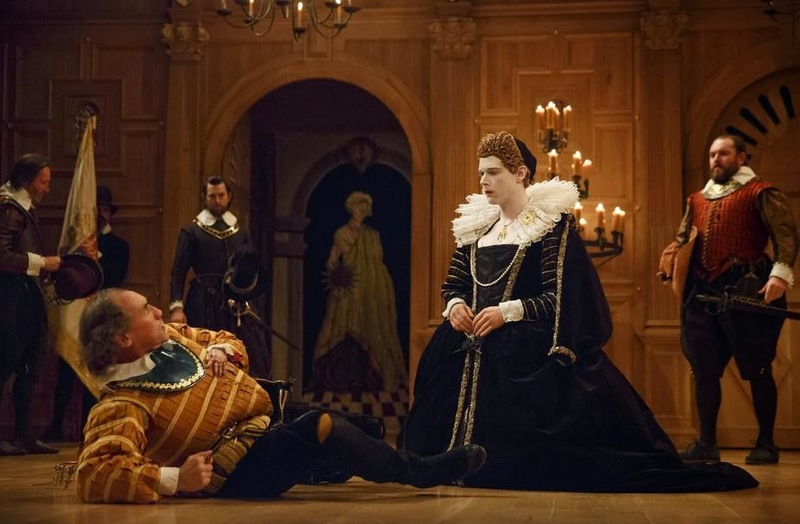 Perhaps more than anything else, these plays were fun; especially Twelfth Night (it’s admittedly harder to have fun when the Duke of Gloucester is murdering children in their beds). The audience was eager and willing (and surprisingly sophisticated for Broadway — most around me were die-hard theatre (and specifically Rylance) fans, trading stories about the shows they’d seen in New York and London and wherever else (my kind of people! )), and the actors and other production elements intentionally brought us in. There was a winking sort of complicity between the actors and audience, and an acknowledgement that we needed each other to make real the worlds of the plays. Viola is pretending to be. Hilarity ensues. This photo gives a sense of the set. 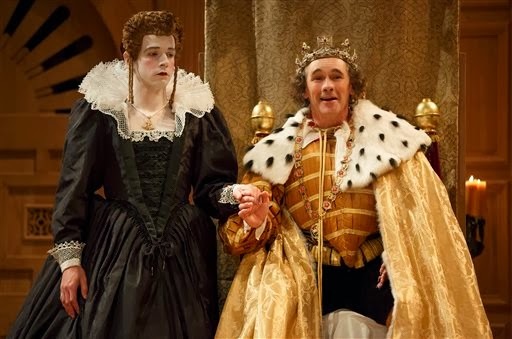 And here’s a video featuring Rylance’s Olivia and Fry’s Malvolio. Elizabeth and her son, the prince. I WILL go with you someday!